My nerdy history interest in England has continued for many years alongside an abiding fascination with Ancient Egypt, Greece, and Rome. One of my latest purchases is Mary Beard’s SPQR. In the world of fictional detectives, I’ve been a devoted follower of Lindsey Davis’s Falco series. So of course Pompeii fascinates me. There are much longer programs on the subject, including this one hosted by Mary Beard. But I found this short video animation rather haunting. 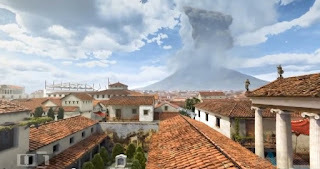 You can read more of Mary Beard on the subject of Pompeii here. As a child, I was sitting up one night, much later than usual because there was a bat in my bedroom. The TV was on and there was a program. All I remembered was the cast of the dog. Years later, I figured out I was matching a documentary on Pompeii. My father had big picture book on the latest excavations c.1963. I still have that book and still read it compulsively now and then, wandering what that day would have been like. Pompeii has haunted me since I was probably six years old and I am 58 today. So, WOW, to this. So glad to hear you love Lindsey Davis. I became hooked on Falco when my kids were small and we lived in Wash,DC. At that time the books came out in the States with as much as a 2-year delay after their British and Canadian publication. So, when we returned to Canada on home leave in the summers, the first thing I used to do was race to Nicholas Hoare's bookshop on Sussex Drive in Ottawa to get the latest in the Falco series. It was pre-internet days! P.S. My grandmother had photos she had taken of Pompeii in 1913 while on a European tour (also of Prussia, which seems astonishing for some reason).